-Debut album from this French Black Metal act produced by Totenkopf Propaganda. -Cult Polish Black Metal split. -Superb dissonant, epicly crafted Black Metal from Germany. -Swedish underground Black Metal, their first full-length album. -Back in stock! Cult Ukrainian Black Metal. 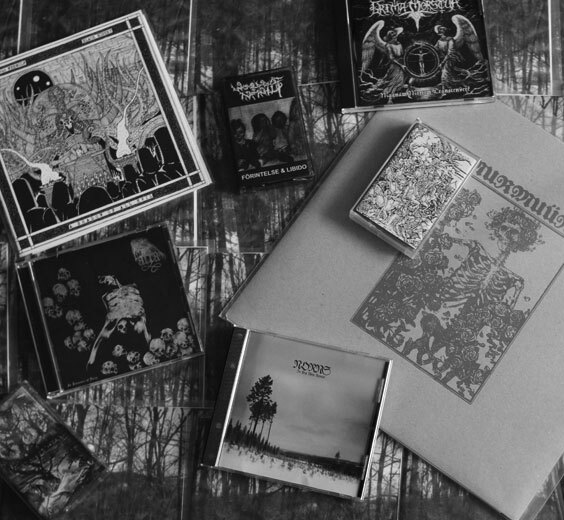 -Compilation of the first 4 demos of this vile, rotten & melancholic Black Metal entity. -Pays homage to the destruction of man and flesh... Raw, Primative Black Metal from spheres beyond. -Black Metal from Chile with the old vibe of the mid-nineties. -Classic Black/Dark/Doom Metal executed by this Chilean band, originally released back in 1996. -Chilean Black Metal with folk, fantasy and ambient parts. -Mandatory, color cover version released by Hammer of damnation version. -Swedish Black Metal inspired by honor and war. -Four long tracks remembering the old ancient gods of the underground. -Classic Polish Black Metal demo, recommended! -Debut demo of this obscure Brazilian Black Metal band, recommemded and rare! -Raw Black Metal from Belgium. -Unreleased and rare tracks of Old School Black Metal belonging to the Necromantical Concilium Black Metal circle, highly recommended! -The debut album from this promising German Black Metal troup that adds just enough thrash into their traditional sound to crank up the intensity level into the red. -Only a few in stock, act fast. -Polish leading Pagan Black Metal force. -Occult and Grim Black metal, representing the fire of opposition in every man, its recognition and its manifestation... only for the initiated. -Raw and raqdical Black Metal from France. -Back in stock! Cult Black Metal from Ukraine. -Blasphemous Black Metal from Belarus. -Before they started denying their human origins, released by Oriana and Ancient Nation. -Typical Black Metla from Ukraine. -Classic Polish Black Metal demo released under the wings of the mighty Garazel Productions. -Raw heathen Black Metal with Ambient parts. -Blasting, blown out, fuzzy, heavy, epic. You need this record. -Misanthropic and depressive Black Metal from France. -Primitive melancholic typical Finnish Black Metal played at a very high level, highly recommended! -Swedish Dark Ambient with the aim of expanding cinematic sound design into music. -Back in stock! One of the best band of the Blaze Birth Hall gang. -Classic underground Black Metal split from 2004 reissued. -Pagan Black Metal featuring members of Opera IX, A Forest, Huginn, The True Endless and Darkness. -Italian mediaval accoustic music, recommended. -Representing the cold and white landscapes of the north through a 56 minutes tribute to early 90's Black Metal. -Swedish thrashing Black Metal, a compilation spanning 1998 through 2007 from various albums, splits, etc. -Grim and mysterious Black Metal from Brazil, very creepy. -Second demo of this Croatian Black Metal horde. -Rituals of highest wisdom performed in the night, highly recommended! -Pagan Black Metal featuring ex-members of Great Vast Forest. -Debut album from this German suicidal Black Metal project. -Chaotic and raw Black Metal from one of the oldest Hellenic bands, existing since 1988. -Heathen Black Metal from Argentina, Total War Records version. -This band is copying Hellhammer in a very authentic manner, love it or hate it. -Reminiscence of cult Polish Black Metal, absolutly recommended! -Mystical Industrial induced Black Metal, recommended! -Cult underground Black Metal from Spain. -Back in stock! If you need a description, you don't need it. -Melodic Black/Death Metal from Canada. -Taking cue from some of the more early-heathen Black Metal acts like Borknagar or Enslaved and incorporating it with the sounds of American bands like Pantheon..
-Viking Black Metal with a strong belief in Germanic paganism and ancient European folklore.